Ruaha River Lodge: located inside the park & consisting of 24 stone chalets stretching along the river bank with stunning views from a large veranda out the front, while the huge interiors feature a sitting area, writing desk and either twin or double beds. At the rear of each chalet is a large bathroom decorated with found timber, a shower and double basins. 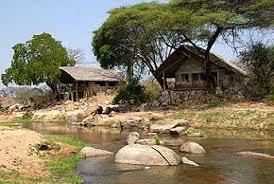 The first dining area is a long banda by the side of the river. Breakfast is the perfect time to watch the game meander down for a drink, while evenings can be spent around the fire pit, looking down the river, or curled up in one of the sofas with a drink and a book. The second area is imperiously-positioned atop the largest kopje in the area, situated on a bend, and enjoys commanding views down two sections of the river. 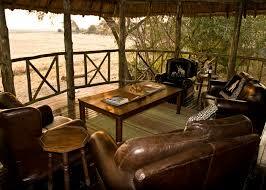 This is surely the best sundowner spot in Ruaha.